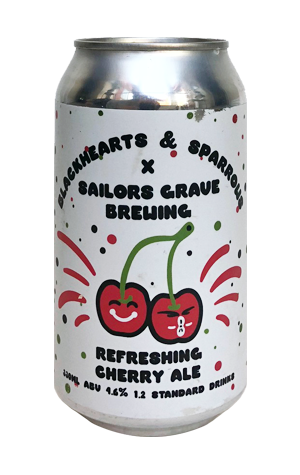 Around this time in 2018, the entities that are Sailors Grave and Melbourne purveyors of fine booze Blackhearts & Sparrows joined forces to create a beer together. It was inspired by American orange cream soda and was a lively, refreshing affair. And now they've looked to do something similar, albeit with cherries, inspired, quite possibly, by the fact the bottleshop group's beer buyer is called Cherry. As we've come to expect from the Gippsland crew by now, ingredients are handled with a degree of subtlety, with the fruit turning the beer a shade best described as Tizer or Irn Bru like (at least, it would be best described that way if The Crafty Pint was based in the UK...); a lively copper with a hint of pink. A gentle sourness is balanced by a touch of lactose-derived creaminess with the result that the cherries present more as the sweet cocktail or dessert kind than anything sour or tangy.